Every time I talk to friends they tell me, ‘oh you should write that down!’ and I think, why? It’s funny in the moment of oral storytelling but would that translate to the written word? I’ve decided to find out. Every so often I am going to digress from writing, and share a story. Let me know if you find this a stupid idea. 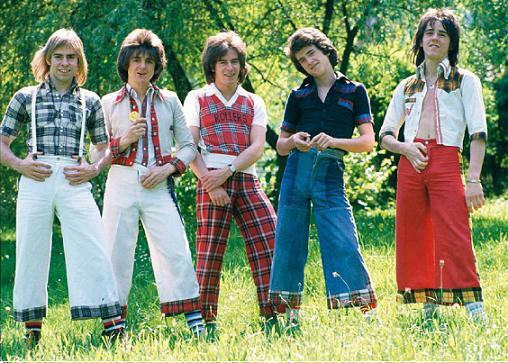 Back in the 1970’s we were madly in love with the Bay City Rollers, a pop band from Scotland. Last week while driving one of their songs played. I was instantly grinning and happy and started telling my patient teenage son stories. The Bay City Roller conventions in Seattle where we would bum rides from parents or take the bus into the city, gather at the Seattle Center with lots of other crazy teen girls, and immerse ourselves in Roller fandom. We wore the required uniform of short pants with tartan trim and striped socks, and carried long tartan scarves with the name of our favorite Roller on it. We formed huge human pyramids for some reason. We trekked to Pike Place Market, clutching our dollar bills to buy black and white photographs. We came home blissed out. The hundreds of letters we mailed out. Keep in mind this was before the internet, social platforms, and cell phones. We had pen pals. Not only did we write letters we highly decorated the envelopes. Stickers of our favorite Roller, labels of the same, with lines of songs or poems. Stamps that we put on upside down, and then wrote, around the stamp, ‘Roller fans stompin’ round, put their stamps on upside down’. Must have driven the post offices crazy trying to find the addresses. Then there was The Trip, still talked about stridently, by my brother. A camping trip back to Montana, where us kids rode in the camper (allowed at the time). My sister and I were riding high because the Rollers were coming fora concert. We had their new release ‘You Made Me Believe in Magic’ on a cassette tape that we had recorded off the radio station. During hours and hours of driving time, we played that one song over and over, while my brother suffered. And threatened to throw the recorder out the back. And then threatened to throw us out the back. And of course the concert itself, arriving outside the Paramount theater in the wee hours of the morning, standing in line all day, and then standing on the arms of the chairs inside, during the concert, absolutely convinced that your Roller looked right at you and your madly waving scarf. My son said it sounded like Justin Bieber and girls right now. Who? I told my son that it wasn’t the song making me smile, it was all the memories associated with it. Those giggly days of making new friends and innocent fun. Well, innocent for the most part. Slumber parties and posters on the wall. About half an hour later a song came on that made my son laugh. It reminded him of when he was little and seriously believed he had super hero powers. I told him he’d just had a Bay City Roller moment. I think every generation has females out there who can point to similar moments, and who still smile when a certain song plays. Oh, dont think you are too old for this! Let your inner child out and have fun, feel like a teenager again and enjoy it!! You can always dream, nobody can take that from you! Life is too serious anyway! Well, it was back in the 70’s and I was sweeter then! I was waiting to see what you would say! I have this clear mental photograph of you with your scarf, beautiful long straight hair, and bell bottom jeans. A mental photo as all my pictures from those days, plus from our travels together were lost when snow collapsed a roof. But I remember! I’m willing to bet we had the same poster. Since all four walls were papered, along with the closet door and bedroom door. Just to help out that inner 14 year old, we heard very little music during the concert; just lots of screaming. But still…it was fun.